"We hold these truths to be self-evident, that all men are created equal, that they are endowed by their Creator with certain unalienable rights that among these are life, liberty and the pursuit of happiness." These are foundational words upon which this country was built and the creed which Americans are to believe and live by. There is no room for hate and bigotry with these words. These words are inclusive of all men â€” white, black, brown, educated, uneducated, rich and poor, people of faith and of no faith. 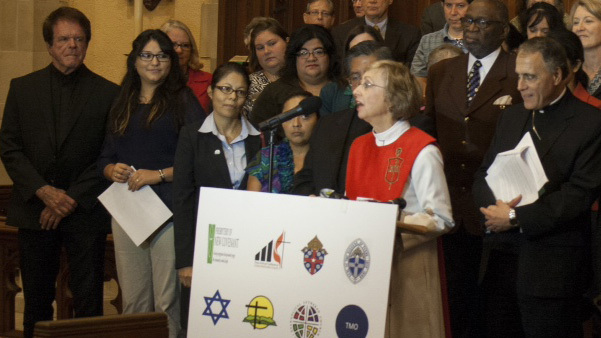 In the face of increased deportations and growing fears of family separation, TMO clergy and Texas Bishops held a joint press conference calling on Congress to pass comprehensive immigration reform with a path towards citizenship. Catholic Cardinal Daniel DiNardo stood with United Methodist Bishop Scott Jones, Lutheran Bishop Michael Rinehart, Presbyterian pastor Rev. Lynne Hargrove, Episcopal pastor Rev. Uriel Osnaya, Baptist pastor Rev. John Ogletree and other clergy in a public stand against the deportation and separation of immigrant families. As the 40+ anniversary of the Texas IAF approaches, religious judicatories have begun congratulating the network for over four decades of leadership development and transformation. Descriptions of the work of the network range from "virtuous" to "transformative" and "a force for change." 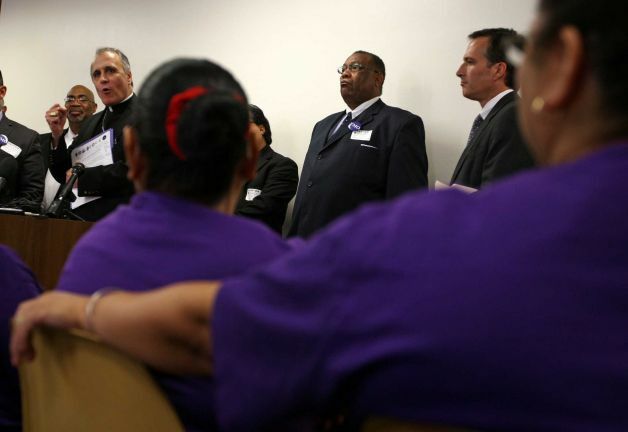 Methodist Bishop Janice Riggle and Catholic Cardinal Daniel Dinardo spoke at a TMO press conference supporting comprehensive immigration reform and condemning the "Safe Act" bill. With clergy and representation from every major religious denomination in Houston, leaders called on those who oppose the SAFE Act to communicate their perspective with the Congressional representatives. Bishop Michael Rinehart of the Evangelical Lutheran Church of America noted that the SAFE Act contradicts the immigration principles local religious leaders first put forth in 2008. Rev. John Ogletree of First Metropolitan Church and Rabbi David Lyon of Congregation Beth Israel also called on Congress to pass comprehensive immigration reform.